Scrapping Out of Control: 3D Wednesday with MCT! 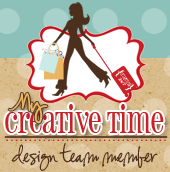 Welcome to My Creative Time's 3D Wednesday! Today's challenge is to create a 3D project that is not a card or a layout. For my project, I made a shadow box of our cute fur baby Roxi. I love this picture of Roxi and wanted to display it in a special way. I used the All Around Birthday stamp set and the Scallop and Stitched Circle Die set to make the clock. The clock hands are from Tim Holtz of course. For the name plate, I used the Build a Banner Kit. I got the letters and numbers from the Any Day Bingo and Crossword set. I then added a border punch around the frame. Isn't my fur baby cute!!! Here are the measurements for the box I'm sure there are a ton of tutorials out there for the box but this was my take on it. FYI, I'm not good at instructions when it comes to measurements but I managed to take a few photos of what I did. It should look something like this. Add the small strip to the inside flaps of the back of the box. Adherer the front piece to the back piece of the box. Hopefully it will all line up..lol.I really hope that made sense. If you have any questions, feel free to ask! Oh and please stop by the DT blogs for more inspiration! Big crafty hugs! Super cute! All of your elements are perfect! Awesome frame....love it!! I love the picture of Roxi!! how creative are you!!! this is fun and fabulous!!! What a wonderful frame. Love the clock. This is too fun and cute! Thanks for the tutorial too! I am going to have to try this one!